According to Web MD, “Do your immune system a favor, and pack some more fruits and vegetables on your plate. They’re loaded with nutrients, called antioxidants, that are good for you.” This is good advice and something my family has been listening to for the last four years. And, it has made a significant difference in our health. If you are one of the many individuals who gets sick often like I used to, a weak immune system may be the culprit. Strengthening your immune system can be as simple as changing your diet. If you don’t want to have to completely change your diet and become a health food foodie, no worries. Healthy Chocolate is a high antioxidant super food and is a great way to increase your antioxidants. If you are not able to or don’t want to eat 8-10 servings of fruits and vegetables a day, eating Healthy Chocolate is a great option. Since the Beyond chocolate is diabetic friendly, gluten free and much lower in calories than candy, this is a great option for most individuals including children. Healthy chocolate, made by Well Beyond Chocolate, a Beyond chocolate brand. owns the rights to the words “healthy chocolate”. This is because this chocolate is actually healthy, It is made with a patented cold pressed method that does not cook or dutch the chocolate like candy chocolate. It also has no waxes, fillers or processed sugars like you would see in Halloween candy typically given to the neighbor kids as they trick or treat. With the threats of Middle-East respiratory syndrome coronavirus (MERS-CoV) infection, Ebola and seasonal influenza, it makes sense to do what ever you can to keep your immune system strong. Simply eating three pieces of Beyond chocolate a day can provide you with the antioxidants you need. The best way to enjoy this healthy dark chocolate is to consume at least three pieces a day, morning middle of the day and evening with a glass of water to keep a peak amount of antioxidants in your body all day. Although the cost of Beyond chocolate is not inexpensive, it is quite affordable for antioxidants. Once you price out the cost of fresh fruits and vegetables daily for each family member, it becomes the most affordable way I know of to get the antioxidants you need to stay healthy. Order yours today at GoColdPressed.com. Preferred customers who order monthly receive a FREE product every third month for the first year and FREE SHIPPING! That is an awesome value you don’t want to miss. 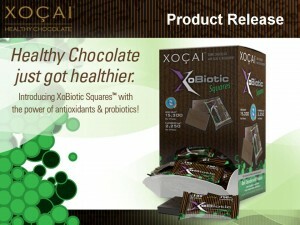 My favorites are the Beyond power square at just 33 calories each or the Xobiotic with probiotic. Not sure which to try, order the variety pack. I am Lynette Henk. I feed my hubby and my three boys Beyond healthy chocolate daily. I can promise you I send my kids away to college with Beyond healthy chocolate or the Xe energy drink. You want your kids to stay healthy and focus on their education instead of worrying about all the illness going around the campus. Call me with questions at 941-216-5727, email me at [email protected] or visit us at GoColdPressed.com. PreviousGoing Gluten Free? Here Are Great High Antioxidant Gluten Free Diet Options Including Chocolate!